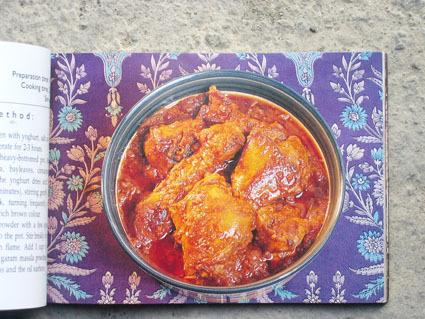 Here is a Kashmiri meat dish quite easy to prepare try it this week end. Mutton large fatty chunks from the loins - 1kg. Dont use bone less pieces. Finely chopped onion - 1no large. Almonds  Blanched & coarsely ground 10 pieces. Grind garlic, ginger, red chillies, cardamom, cloves, coriander, cumin, Kashmiri Lal mirch and salt together and keep aside. Heat ghee. Saute onions until light brown. Add ground paste and bay leaf and stir until fragrant. Add the meat and simmer for a few minutes. Add the ground almonds. Add yogurt and mix well. Stir in the cinnamon, hot water and pepper to taste. Cover and cook on a low heat until the meat is very tender and the sauce thickens. While cooking, stir occasionally to prevent burning. When it is done, discard the cinnamon stick and stir in the garam masala. Cover for a few minutes and remove from fire. Serve both these with hot Basmati rice. Note: If you cant get Kashmiri Lal mirch powder use Paprika, I like the Hungarian ones. 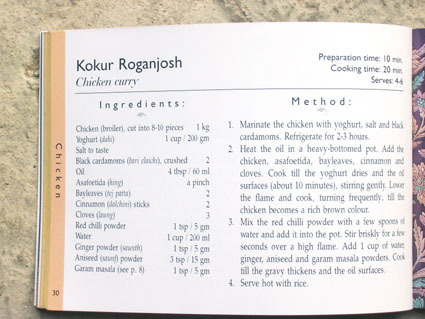 The name Rogan Josh is derived from the flaming red colour & the floating oil in Persian. Woah. I think I will start collecting all your recipies. You should start a blog/site with all of them. I love all yor recipies. Your passion really comes thru. Originally Posted by jyotirmoy Here is a Kashmiri meat dish quite easy to prepare try it this week end. ... But if you possible can.. Get the real thing ! Kashmiri chilli powder has such a great colour without blowing your head off ! A bit like saffron in it's intensity..
Last edited by butterball; Oct 21st, 2005 at 23:45..
What an excellent recipe, I used to use "ghee" in my cooking, but since my cholestral went up, I stopped using it and now fry food in sunflower oil. But it just does not taste as good as food cooked in ghee. The ``josh'' part of the ``rogan josh'' name is a corruption of ``gosth'', meaning sheep or goat meat; ``rogan'' merely means ``red''. Rogan Josh therefore is a LAMB / MUTTON dish. Other (Chicken / Prawn) forms of "Rogan Josh" are mostly inventions by "Indian" curry places in the UK. I first visited London in 1973 to attend a conference on Radar technology. My co-author forced me to eat at an Indian joint. To my dismay I found all the cooks to be of Bangladesi origin from the Sylhet area & some of them were deck hands who had jumped ship. What I ate is better not discussed. Since then I have stopped eating at Indian places in Europe. Pagla bhai I will see the recipe you have directed. Anyway have a nice week end meal. Originally Posted by jyotirmoy Pagla bhai I will see the recipe you have directed.